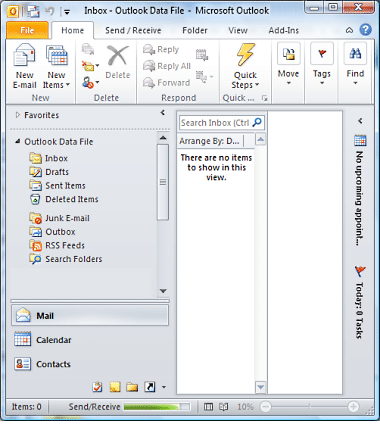 For Outlook MAPI to work, Microsoft Outlook 2010 or 2007 must have been installed on your computer. 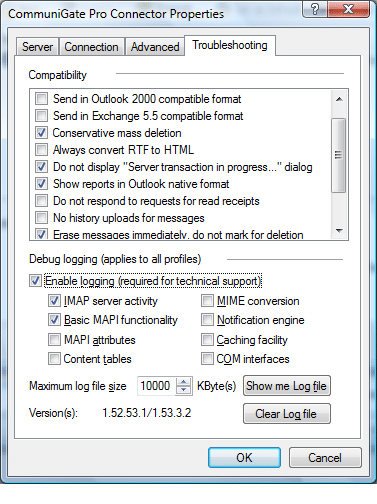 MAPI settings are highly similar for ALL versions of Outlook. 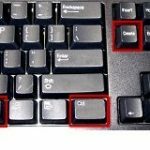 What Is MAPI And Why Should I Download It? 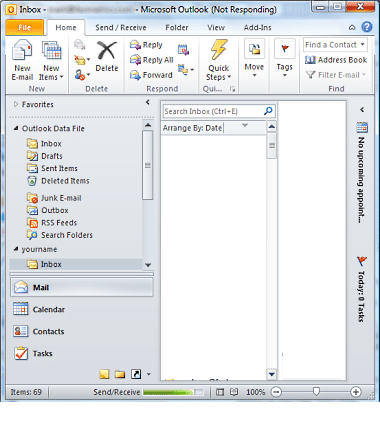 Designed by Microsoft and used since 1997, the Message Application Programming Interface (MAPI) is one of the 3 main email protocols, along with POP and IMAP. 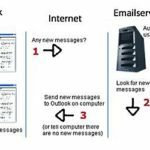 MAPI allows communication between all versions of Outlook, Microsoft Exchange and also some other non-Microsoft email servers. 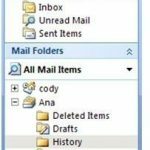 Generally, MAPI provides greater functionality for Outlook email clients than the IMAP protocol. Important: Once MAPI is installed and configured on your system, synchronization is performed. 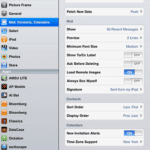 All your existing emails, contacts, notes and calendar information will be synced. 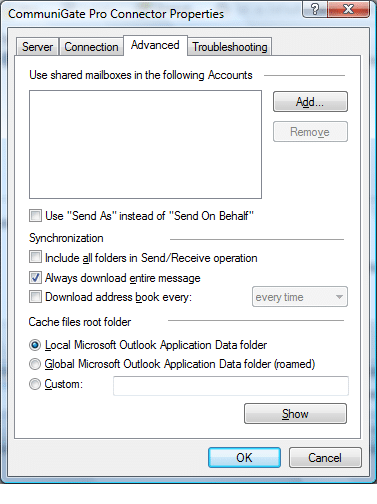 The MAPI synchronization process will not begin until you have relaunched Outlook 2010 or 2007 (after installing MAPI and configuring your account) and you have clicked in the inbox of your new MAPI enabled account. If you have been using your email account for awhile, or have 100 or more emails in that account, this process can take two or more hours. For that reason, we recommend waiting until the end of your work day before following the steps in this tutorial. Step 1: Download and install the free MAPI connector. Click here to download the MAPI installer now. This will download a file named CGatePro-MAPI-Intel-1.54.12.2.msi.zip to your computer. Create a new folder somewhere on your computer, naming it something like MAPI Installer or Connector. Move the zip file you just downloaded to the folder you just created. Select Expand here… from the popup menu that appears. You should now see two files, cgmxp32.ini and setup.exe. Double-click in the file setup.exe to run the MAPI installer. A dialog box may appear warning that An unknown program wants access to your computer and asking if you want to run setup.exe. This is normal, select Allow to proceed with the MAPI installation. Step 2: When this dialog appears, click the Install button. Step 3: When the dialog box appears asking if you want to configure your Mail Profile now, click the No button. The Outlook MAPI connector is now installed. 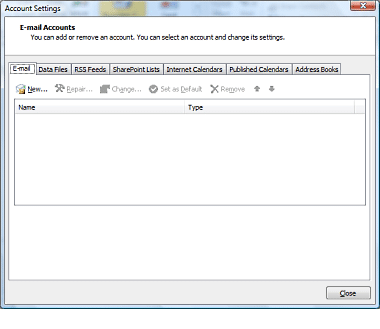 Next, we will configure a new MAPI email account using Outlook 2010. We have used Fastmetrics Enterprise Email account info for the below example. You can setup MAPI with your own personal Gmail or another email account type. Step 1: Launch Microsoft Outlook 2010 or 2007. Step 2: Click in the File tab in the top left corner of the main window. Step 3: Select the Info tab in the left column of the File tab. Step 4: Click on Add Account (the button with the green plus sign). Step 5: Select the E-mail tab. 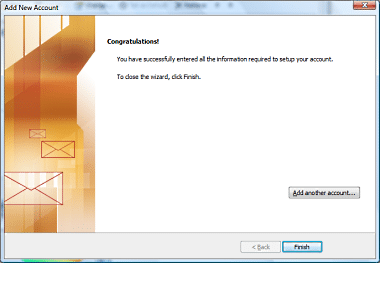 Step 6: Click on the New… button at the far left side of the dialog box, under E-mail. 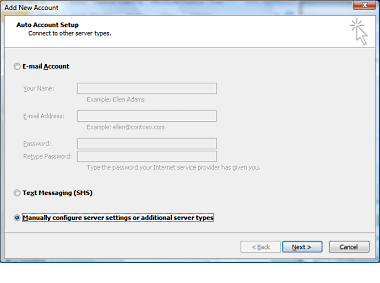 Step 7: Select Manually configure server settings or additional server types at the bottom of the box. 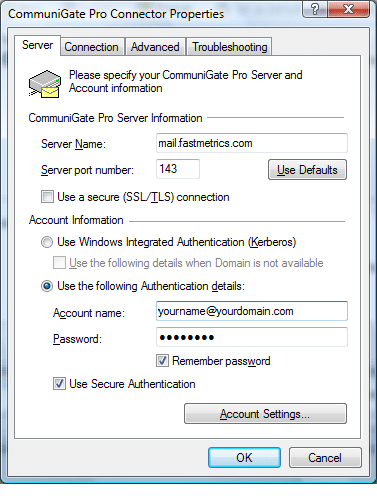 Step 9: Select Other, then choose CommuniGate Pro Server from the list below. Note: For other email accounts, such as Gmail, this is where you would select ‘Internet E-mail’. 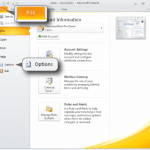 For Microsoft Exchange accounts, select that option. We are using ‘Other’ as this is the Fastmetrics Collaboration Server, which we use to store all our email, contacts, notes and calendar information. Step 10: Click in the Server tab. – For Server Name enter mail.fastmetrics.com. – Leave Server port number set at 143. – Select Use the following Authentication details, then enter your account name and password. 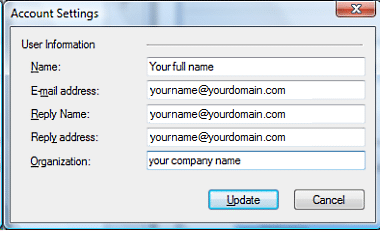 Note: Replace yourname with your actual username, and replace yourdomain.com with your actual domain name. Step 11: Click Account Settings. Clicking on Account Settings will open another box. Step 12: For Name, enter your full name. For E-mail address, Reply name, and Reply address enter your full email address. Step 13: Click the Connection tab. 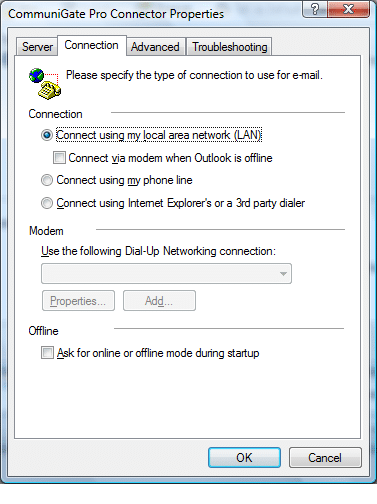 Select Connect using my local area network (LAN). Step 14: Click the Advanced tab. Place a check next to Always download entire message. 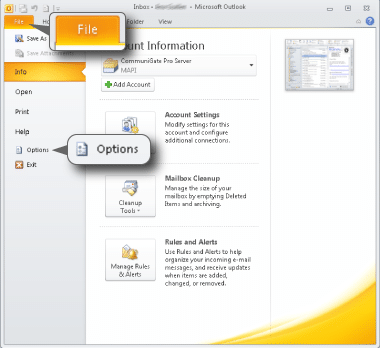 Select Local Microsoft Outlook Application Data folder. Step 15: Select the Troubleshooting tab. Place a check next to Do not display “Server transaction in progress…” dialog. You can optionally select Enable logging or leave this option unchecked. Logging information is useful for our Technical Support Team to troubleshoot for email solutions if required. The following dialog will appear, instructing that you must restart Outlook 2010 for your new MAPI account to take affect. Click the OK button. Installation of your MAPI account is now complete. Click the Finish button. 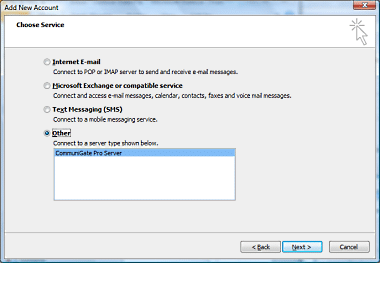 Then exit and restart Outlook 2010. When you restart Outlook, you will notice a new email account displayed in the left hand column. Click on the arrow to the left of this new email account, then click on the inbox. If this is a pre-existing email account, it will take time for MAPI to fully synchronize Outlook with the Fastmetrics Collaboration Server. 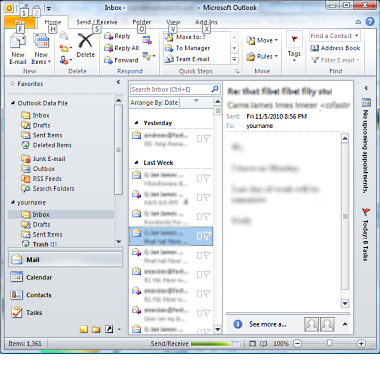 During this time you will see (Not Responding) displayed in the Outlook title bar. This is normal. This process can take take several hours, depending on the size of your Outlook account. For this reason, we recommend waiting until the end of your work day before setting up MAPI. Once MAPI synchronization has completed you will see your email messages displayed in the center column, and (Not Responding) will disappear from the title bar. You have now fully installed and configured MAPI, and synchronized with the collaboration server. The next time you check your email, there will only be a slight delay while your latest emails are copied from the server. Need further assistance setting up MAPI? If you’re an existing Fastmetrics customer, learn how to setup a remote support session with one of our Email Technicians using Logmein123.